Summary: Protect the family jewels. 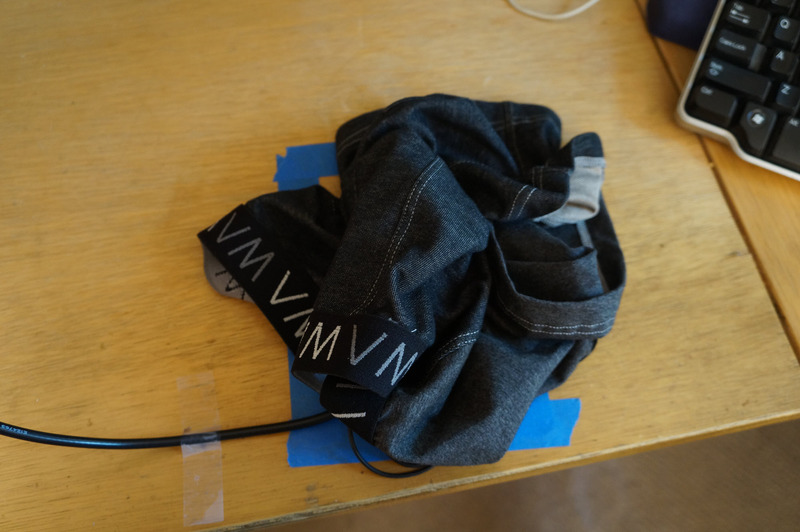 Jack runs experiments EMI-Safe underwear. I guess non-engineers are shocked to learn they are being irradiated. Google "living under power lines" and you'll get 31 million hits, many of which are sites wallowing in fear about that 50 or 60 Hz signal. "Radiation" is a scary word, though some don't understand that frequency and energy are related, and the gamma rays one thinks about when considering nuclear events are above 1019 Hz. The phrase "radiation from mobile phones" returns 2.7 million hits. I have no idea what the actual threat levels posed by cell phones, laptops and the like are. But where there's a fear, there's a market. Wireless Armour (https://wirelessarmour.co.uk/) has come to the rescue with a line of underwear that, they claim, shields male, uh, "sensitive organs," from the evils of Wi-Fi signals. The peril of cellular frequencies isn't addressed, possibly because one uses the phone clamped to the ear. But many of us keep the phone in a pocket, close to those precious parts, and phones do wake up and communicate with the towers from time to time, even when not being used. The use case the company describes is running a laptop on one's lap, so there's little 1/r2 attenuation. The web site says Sir Richard Branson calls these "underpants for superheroes." Now, exactly why one would take reproductive advice from the founder of innumerable "Virgin" companies baffles me. The company helpfully provides a link to a study (http://www.fertstert.org/article/S0015-0282%2811%2902678-1/fulltext) that claims after 4 hours of Wi-fi activity, "samples" located 3 cm from a laptop resulted in, well, some sort of bad stuff. It's one of those academic papers with lots of big words, graphs, and all of that science stuff. Wireless Armour has a video about the product's efficacy, but, alas, that page is broken. So I decided to run some experiments. I will not use big words or any of that science stuff. This is for fun only. Your mileage may vary. No refunds will be given, all warranties expressed or implied are void. Note that in this work I was exposed to certain levels of, well, I admit it: radiation. That may have impaired my thinking. 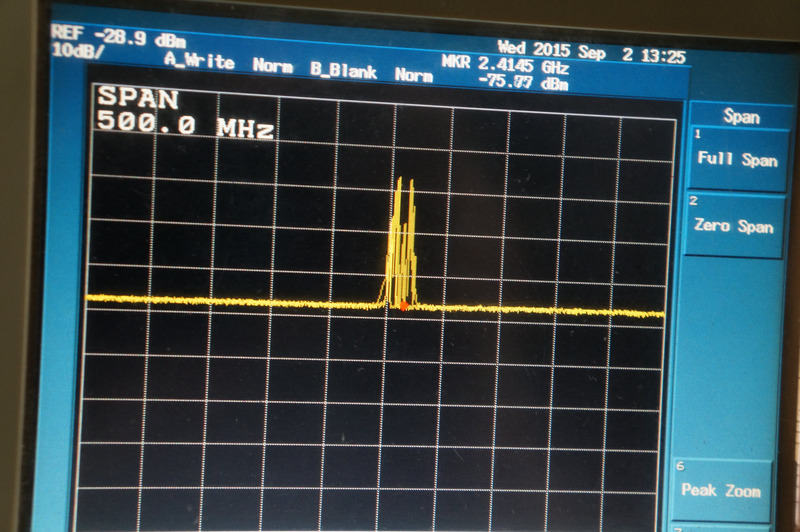 I have some magic crystals on the bench (e.g., 32.768 KHz), which probably provided some level of protection. The web site makes ordering the product simple, and despite the transatlantic shipment it arrived in about a week. Marybeth was immediately curious and not completely convinced that these were simply an experimental test article. I used an iPhone 6 with the cellular data disabled and started an Internet speed check using www.speedtest.net's app. This moved lots of data back and forth over the Wi-Fi link. 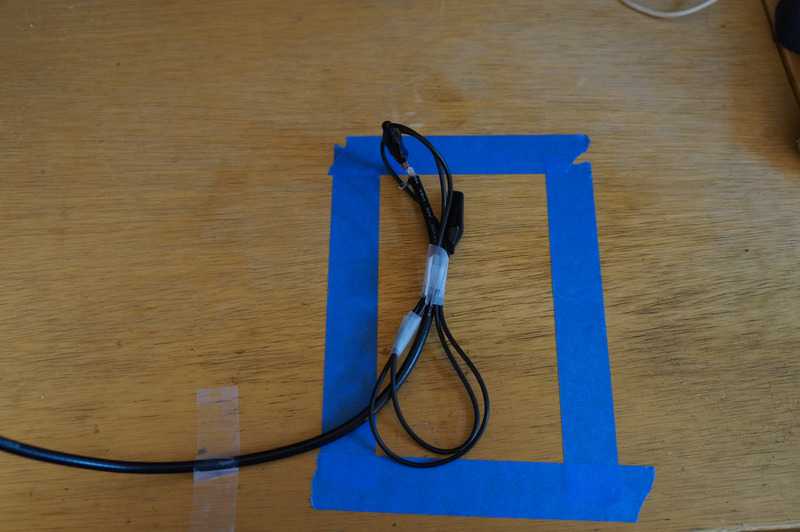 A clip lead served as an antenna for my Advantest R3132 spectrum analyzer (SA). The antenna was taped to the bench so it couldn't be moved. Each division represents 10 dBm. The signal shape appears different between the two SA pictures because it was changing rapidly during the communications with speedetest.net's server. My camera captured what you see, but the general set of signals was about the same. 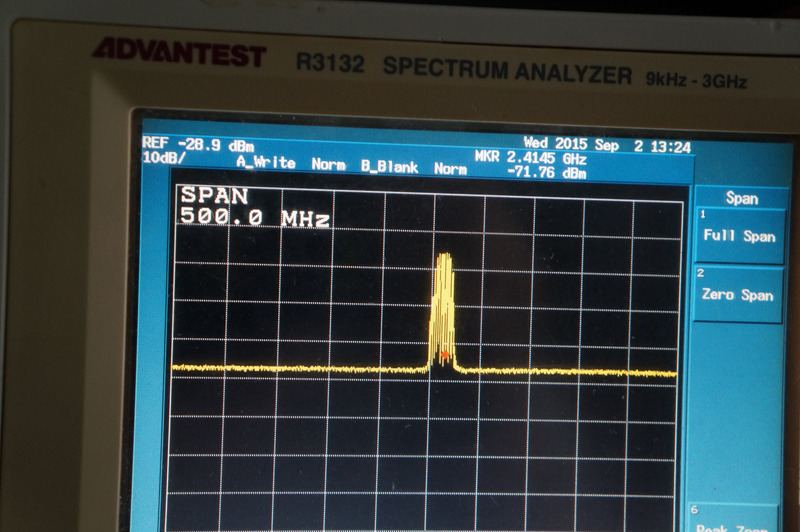 The difference between peak signal amplitudes is barely (pun not intended) noticeable. Perhaps there's one or two dB difference. As a control, I wrapped the antenna in aluminum foil and found a 24 dB reduction in signal strength. Though the website doesn't mention this, the product came with a card that explains it "blocks more than 99.9% of electromagnetic radiation from Wi-Fi, 2G/3G/4G and DECT phone signals, Bluetooth and microwaves." 99.9% is a 30 dB reduction. Final result: the claim is a 30 dB reduction in radiation. I measured one or two dB. The product is available in several styles for prices ranging from œ24 to œ35 depending on style. Sorry ladies, these are for men only. What do you think? Should we use protective garments (assuming one could find some that actually attenuated the signal)?